William (Billy) was born in Boyne Hill, Maidenhead on 8 March 1889 the eldest child of Samuel Peter Quintin and his wife Annie (née Cummins). He was the eldest of five children, the others being Frederick Charles (born 1890), Albert Samuel (1893), Florence Annie (1896) and Cathering Cummins (1900). 3 Hope Cottages (42 Russell Road) where the Quintin family lived when they first moved to Newbury. 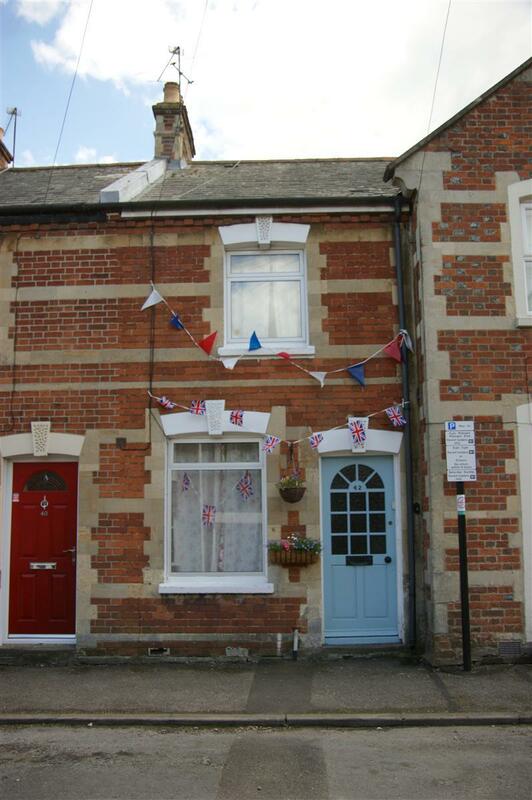 The bunting is in celebration of the diamond jubilee, 2012. At the time of Billy's birth his father was working as a groom, this changed at some point in the 1890s, by the time the family moved to Newbury in 1898/9 he had become a bricklayer, a trade that was always in demand. The building trade, then as now, went through cycles of boom and recession. The family's move to Newbury coincided with a massive boom in house building so he would have found little difficulty finding work. Their move was probably influenced by Annie's desire to be closer to home (she was born in Crux Easton a few miles south of Newbury), but it was also familiar to Samuel who, aothough born in Dorset, had spent several years of his childhood in the town. They moved to 3 Hope Cottages, now 42 Russell Road, one of the many similar houses constructed over the Newbury's old West Field in the late C19th early C20th (though the brick/stonework was fancier than most. Billy was sent first to St Mary's School, Speenhamland, and went on to St Nicolas' School in Enborne Roads, where he started on 8 November 1897, aged 8. He left St Nicolas' on 20 November 1902; the school admissions register records, where known, each pupils first employment. In Billy's case this is recorded as 'Reformatory'. William and Frederick Quinton, aged respectively 13 and 12 years, sons of a bricklayer, were charge with stealing a cash-box containing the sum of £2 2s in money, belonging to Alexander J Felton, tailor, of 102, Northbrook-street, Newbury. Mr Felton deposed that the prisoner William Quinton, had been his errand boy for a week. The cash-box was left in the shop drawer on he night of the 14th. It contained a number of papers, including birth and marriage certificates, two cheques, and a sum of £2 2s in cash. The lad was the first to enter the shop on Saturday morning at about 8.20, but when witness went in five minutes later, the drawer was open and the cash-box gone, while the prisoner had also disappeared. The cash-box was locked. PS Maunders stated that he arrested the two prisoners at their home in Russell-road, West Fields, on the previous evening. They had nothing on them. William made a voluntary statement to the effect that they threw the cash-box into the river, after they had taken two sovereigns and a two shilling piece out of it. They buried the papers in the bank near Ham Mills, and threw the cheques into the water. Witness afterwards found the papers buried as described. The prisoners' father informed the police immediately the boys came home. Frederick was wearing new boots, new trousers and a cap, and William had on new trousers, which they had purchased at Maidenhead. The boys had walked to Thatcham Station, whence they too train to Maidenhead, going on to High Wycombe, Sipliake, and back to Reading, from where they walked home to Newbury. Both prisoners pleaded guilty, but had nothing to say. Their father said they were beyond his control. Both lads were recently before the County Magistrates on a charge of cruelty to a donkey, and were fined. The Magistrates decided to send them both to reformatory, but they would be remanded for enquiries to be made. A remarkable case came before the Newbury magistrates yesterday, two boys, named Quinton, brothers, aged respectively thirteen and twelve years, being charged with stealing a cash-box, containing gold and silver, from the premises of Mr Felton, tailor. The boys visited Reading, Maidenhead, Wycombe, and other towns, and, having spent the money, walked home. The magistrates decided to sent them to a reformatory institution. Frederick and William Quinton, brothers, aged 13 and 12, and Thomas Cook, 12, and Sidney Allaway, 11, were summoned for cruelly ill-treating a donkey, in the parish of Enborne, on the 2nd, 3rd, and 4th ult. They each pleaded guilty. Supt Rowbotham said he visited a field by the canal side on the 15th ult, where in the presence of Mr C W Adey, the owner of the animal, and Mr E C Howard, veterinary surgeon, of Speenhamland, he saw the body of a donkey, which had been exhumed. It showed signs of ill-treatment. Mr Howard deposed as to the nature of the injuries, which were of a very bad character, and unheard of in any previous cruelty case. He could not certify that the injuries had caused death. Inspetor Stride, of the RSPCA, state that he saw one of the boys at the National School, whose evidence incriminated himself and the three other boys. The Chairman told the boys the Magistrates considered this a very cruel case, and regretted the law did not allow of their being flogged. They hoped their fathers would do it. Addressing the parents, who were in Court, Mr Tull said if they kept their children regularly at school this would not have happened. If the boys were brought there again they would not be let off so lightly. They must each pay 15s including costs. Billy appears to have been on a very bad path. It is not known which reformatory he was sent to, but it may well have been what was known as an Industrial School. The aim was rehabilitation and in Billy's case it seems to have worked. At the school boys would be taught a trade which should hold them in good stead after release. Perhaps this was where Billy first started to learn the skills of a boot-maker. Even though he may have been started in the trade while in an Industrial School further training (usually through an apprenticeship) would have been needed. By 1911 he was boarding with Frank Rivers and his wife, Maud, at their house in Rockingham Road. Frank was only a few years older and but had opened a boot-making and repairing business at 16 Bartholomew Street in 1908. It seems likely that Billy was working from Rivers at the time. 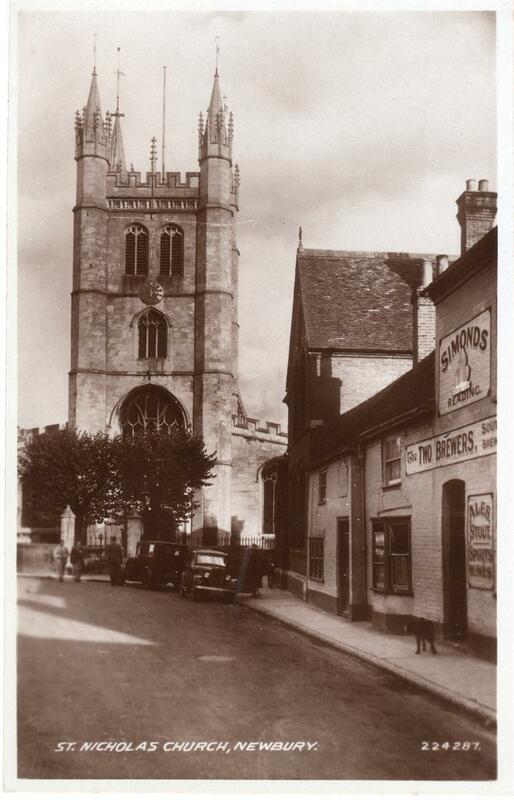 Billy and his father obviously had a difficult relationship at one point, and his living with the Rivers rather than at home could also indicate a distance between them – but around this time Billy took up a hobby of his father's and joined the bell-ringers at St Nicolas' Church in central Newbury , which suggests their relationship had much improved. He also demonstrated a new attitude to the law - the once out of control teenager became a Special Constable, a part-time volunteer policeman. The bell tower of St Nicolas' Church in Newbury, where Billy and his father were keen members of the ringing band. In 1914 Billy married Beatrice Emma Franklin and set up home at 5 Berkeley Terrace (Berkeley Road), their first child (Margaret) was born in 1915. A few months after their marriage war was declared. The first of the family to volunteer was Samuel, who had previously served in the Newbury Company of the 1st Volunteer Battalion, Royal Berkshire Regiment and won prizes in 1900, 1902 and 1903 for his ability with the rifle. 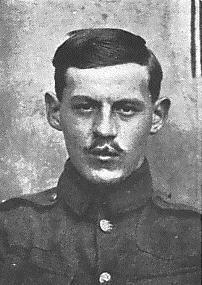 He enlisted into the 4rd Battalion, Royal Berkshire Regiment, on 16 September 1914. He spent the war on home service, first with the Royal Berkshire Regiment and then with the Royal Defence Corps. This is typical of many older Newbury volunteers who served as prison guards first at the internment camp on Newbury Racecourse and later at various POW camps. He was demobilized on 1 March 1919. Billy signed up with the Royal Berkshire Regiment on 1 December 1915 - this was almost certainly an attestment (filling in a form testifying to a commitment to serve) under the terms of the Derby Scheme. Under this scheme (named after Lord Derby the minister responsible for recruitment) men attested, not to serve immediately, but to await call-up with their 'group' - hence its alternative name of the ‘Group Scheme’. A man's group depended on age and marital status; as a married man born in 1889 William would be in Group 32. This group began to be called up in March 1916 with a month's notice to join their regiment for training. By this time conscription had been introduced and it was possible to appeal against one's call-up. Billy was the subject of such an appeal, which significantly delayed his final enlistment. The appeal was made by his employer, Mrs Rosier, who was concerned at the loss of a valuable employee doing work of importance to the community (boot repairs). Billy had evidently moved on from Frank Rivers’ employ to that of the Rosiers (Francis Charles and Phyllis Lizzie) who owned Swaite’s ‘boot and shoe warehouse’ at 48 Bartholomew Street. Mrs Rosier, boot dealer, of Bartholomew-street, appealed in respect of William Quinton, boot repairer. She said her husband joined the Army on the understanding that the Tribunal would grant exemption to this man if he went. The military representative assented to a temporary certificate, and offered to provide a substitute. The Tribunal grant until November 30th, and recommended Quinton to arrange for medical examination. The offer 'to provide a substitute' inferred that the military would source a replacement boot repairer for the Rosiers' business. The recommendation for a medical examination was an attempt both to prevent future appeals on grounds of health and to provide the Tribunal with additional information when Billy next appealed (they were more likely to spare a man military service if he was only fit for home service). The military representative was unsuccessful in his appeal against exemption till October 30th to William John Quinton, 27, boot-repairer, Russell-road, Newbury, employed by Mrs Rosier, Bartholomew-street, Newbury. One of these reports has the date wrong, perhaps the latter as it's standard of reporting was evidently not of the highest standard - the reporter could not even get Billy's name right. Once his exemption period expired the military were able to call him up; he joined the Royal Berkshire Regiment for his training and was given the regimental number 33511. By this time a distinction was being made between training and service, previously a man would train with a regiment and then join one of its fighting battalions overseas. Although training was still being done by elements of the line regiments a man coming out of training would be sent to an Infantry Base Depot (IBD) in France for allocation to a front line battalion. This may be a battalion from the regiment where he trained, or it could be another battalion serviced from the same IBD. In Billy’s case this meant a posting to the 8th Battalion, Gloucestershire Regiment and a new regimental number - 37995. It would appear that he got leave in the period April-June 1917 (his second child, Winifred, was born nine months later). Perhaps this was his 'draft' leave, a few days allowed to men shortly before they were posted abroad. In September 1917 the 8th Gloucesters were part of the 57th Brigade in the 19th (Western) Division, which was responsible for a section of the line south of Ieper (Ypres) near the Belgian village of Wytschaete (White Sheet to the tommies). On 20 September the British launched an offensive known to history as the Battle of the Menin Road one of the constituent elements of the 3rd Battle of Ypres. The 19th Division were at the southern extreme of the attack, advancing about 600 yards and covering the southern flank of the main thrust towards Passchendaele ridge. 20 September 1917 : Battalion participated in an offensive. Zero hour 5.40am. Left front line at points J.31.a.5.3 to J31.a.25.00. [map references] First objective J.31.d.4.8 to J.31.d.1.5 reached with comparative ease and this line consolidated. Our advance to final objective strong points and snipers dealt with. Objective at points J.32.c.25.35 to P.1.b.85.50 was eventually reached at 7am. Enemy artillery barrage on original front & support lines very heavy. Casualties 2nd Lt R W Kimber & 2nd Lt J H Humphrey killed Lieut F J Nicholas & 2nd Lt T M Colcutt wounded – Other ranks 160 killed, missing & wounded. The juxtaposition of the words 'comparative ease' and 164 casualties out of a typical battalion strength of 600-800 makes strange reading. Billy Quintin was one of the other ranks who died that day. QUINTIN – Killed in action in France on September 20th, 1917, William James (Billy) the dearly beloved husband of Beartice E Quintin, and eldest son of Mr S Quintin, 5, Berkeley-road, aged 28 years. – 8th Batt Gloucester Regt. Pte William Quintin, of the Gloucester Regt, is reported as being killed in action. He was a bootmaker before enlistment, latterly in the employ of Swaite’s, Bartholomew-street. He joined the Berkshire Regiment, and was transferred to the Gloucesters. His widow and one child live in Ena-terrace, West-fields. He was a special constable, and a member of the St Nicholas band of ringers. His father, Pte Samuel Quintin, also a ringer, was a member of the Newbury Volunteer Company, and is now serving in the Royal Defence Corps. 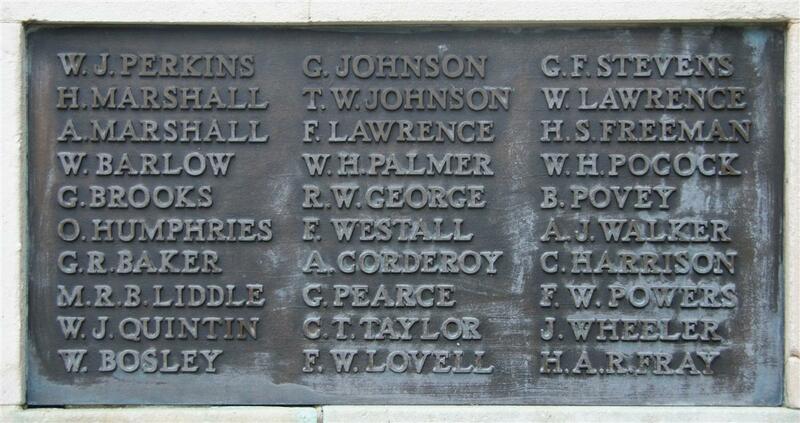 William's body was not recovered from the battlefield in a recognisable state; his name is recorded on the memorial to the missing at Tyne Cot (panel 74 or 75). Locally Billy is remembered on Newbury's Town War Memorial and also on a memorial board and a roll of honour in St Nicolas' Church, Newbury. Also in the church is a special memorial in the bell tower commemorating Billy and one other bellringer who died serving his country in the Great War. St Nicolas ringers paid appropriate honour to a soldier comrade, Pte William Qunitin, who had fallen on active service, by ringing a half-muffled peal on Saturday afternoon. They were prompted by the lines:- “The comrades muster round the old church tower, To tell the tidings sad with bated breath; Then let the bells ring out in muffled power, Their sad requiem for a soldier’s death.” The ringers were D Geater, H Curtis, C Crawford, E Stillman, C Osgood, R Dixon, F Bumpstead, A Barber, E Crocker, E Challis. At the conclusion of the peal the Rector, who had come into the ringing chamber, conducted a short memorial service. He also thanked the band for the reverent tribute of honour to a fellow-ringer, who had given his life for his country. Billy was wealthy enough to warrant his estate being passed through probate; administration was granted to his wife, Beatrice on 30 October 1917 on his estate - valued at £200. Beatrice was living at 8 Ena Terrace (95 Russell Road). His brothers, Frederick Charles and Albert Samuel also served in the army from early in the war. Albert had the misfortune (luck?) to be taken prisoner and spent part of his war in a German POW camp. Thanks to Karen Newbery for help researching this soldier.